Sustainable timber – what exactly is it? Wood is a natural material and so is classed as a coming from a renewable source. Trees grow and we cut them down to make timber that can be used in all sorts of ways. 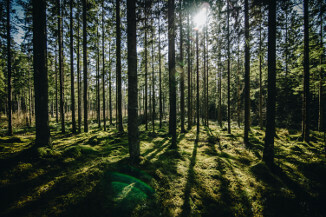 Sustainable timber is that which comes from forests that are replaced as they are harvested – in other words, they are managed so that the logging does not outstrip the ability of the forest to re-grow and provide a source of food and shelter for all those plants and animals that rely on it to survive. Trees also soak up carbon dioxide, removing it from the air that we breathe and keeping our air cleaner than it would be otherwise. A sustainably managed forest is also one that ensures we have a regular supply of timber as we need it, making it a truly renewable material source. What woods are not sustainable? No matter how hard you try with certain species of wood, they are currently unsustainable for a number of reasons. They may be illegally logged, which means they are not being replaced at a rate that will make them sustainable or managed to avoid any repercussions on the flora and fauna that rely on them. They may be slow-growing species of wood; hardwoods such as teak or ebony, among others, are slow to grow and therefore have a much higher value making them attract to illegal and unscrupulous loggers. Sustainable timber is certified by the Forest Stewardship Council, or FSC, an international organisation that promotes and assists in the responsible management of forests, worldwide. When sourcing timber for any reason, look for the FSC label so that you are sure it is from a sustainably managed source. Look for timber that is sourced from within the European Union. That way you know that it will comply with international regulations and will not be illegally obtained. Having said that, there are still certain forest types that need more management and for a longer period of time to get them back to the level they should be at for them to be sustainable. For full details, head to the FSC website. Species such as bamboo and rattan are not FSC certified, but can be sustainable due to the fast growth. Check with your supplier for the latest information on where their bamboo comes from and how sustainable it is.